Hanoi (VNA) – Deputy Prime Minister and Foreign Minister Pham Binh Minh on September 12 met with Timor-Leste’s Minister of Foreign Affairs and Cooperation Dionisio Babo Soares on the sidelines of the World Economic Forum on ASEAN (WEF ASEAN) 2018 in Hanoi. 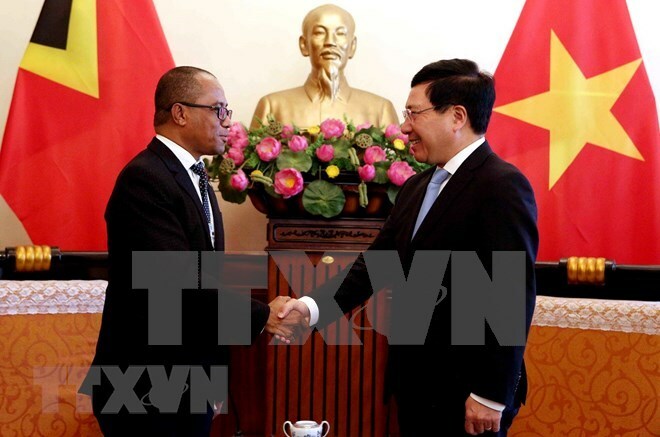 Minh once again congratulated Soares on his appointment as Minister of Foreign Affairs and Cooperation and affirmed that Vietnam will work closely with Timor-Leste to enhance relations between the two countries as well as cooperation between the two foreign ministries in particular. The two ministers discussed measures to further promote partnership both bilaterally and multilaterally. They agreed to increase the exchange of visits at all levels as well as people-to-people exchanges in a bid to enhance mutual understanding. Minh asked Timor-Leste, together with Vietnam, to promote cooperation mechanisms, firstly the joint committee as agreed in the Frame Agreement on Technical and Economic Cooperation signed in 2010; to effectively implement the agreement on rice trade for the 2015 – 2017 period; and push forward the negotiation on an agreement on investment protection. Soares, for his part, said Timor-Leste wants to step up cooperative ties with Vietnam in other potential spheres such as defence, security, agriculture, fishery, oil and gas exploration and exploitation. The two sides agreed to continue coordinating at regional and international forums and emphasized the importance of maintaining freedom, security and safety of navigation and aviation in the East Sea and settlement of disputes through peaceful measures and based on international law, including the United Nations Convention on the Law of the Sea 1982 (UNCLOS 1982). Minh thanked Timor-Leste for its commitment to supporting Vietnam’s candidacy for a non-permanent seat in the United Nations Security Council in the 2020 – 2021 term.